I didn’t start out working here doing deliveries, and it’s not in my job description. But during our busier times, I put myself on the delivery schedule to give our (very tired) staff a weekend. I have to say, I do enjoy going out on deliveries. When we have our consultations with our clients, we hear tidbits of how the room will look on the day of their events. When we deliver, we are usually one of the last vendors to put something in the room so we get to see the room almost completed. Yesterday I delivered a birthday cake to a client in West Orange NJ. Elayne was celebrating her 70th birthday and her wonderful family (whom I met most of that day) had planned a large celebration in her honor. When I showed up to the location I met the designer/florist, Debbie from Debbie’s Designs. 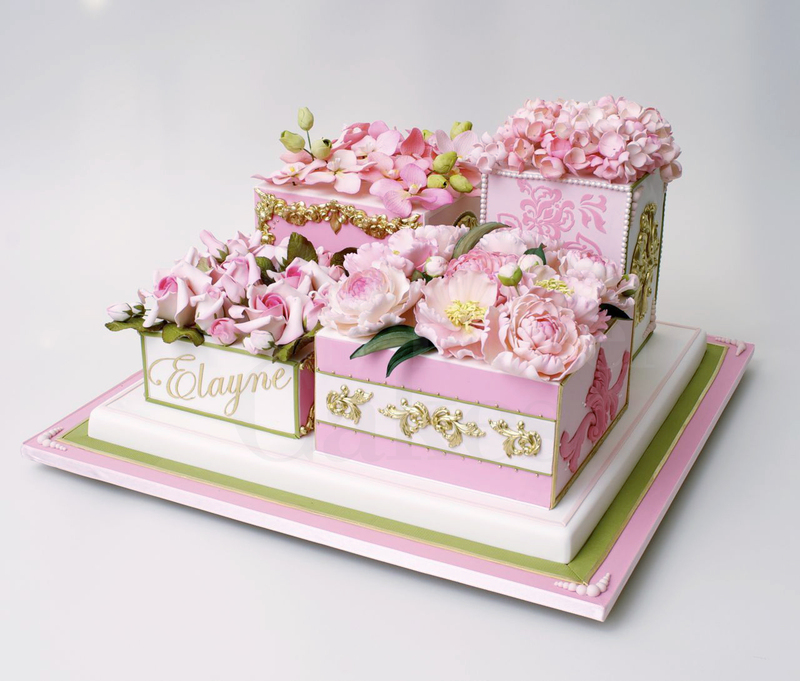 The flowers that were chosen for the party were so pretty and feminine; I think a lovely choice for Elayne. A beautiful view for Elayne's birthday party on the left and the flowers that were chosen for the celebration. When I took the cake out of the box, the staff, decorators and the party planner, Diane shrieked with excitement. (I do use the word “shriek”, because that is exactly what they did.) I was so happy that the staff was able to translate exactly what our clients wanted. I was smiling from ear to ear and very proud of our staff as they had worked very hard on this particular design. Diane from Fancy That had said, “That cake made the party!”. Elayne likes the color pink and all things Parisian. This was the inspiration for her birthday cake. No need to write "happy birthday" when a name in beautiful script will do! Happy birthday Elayne, I hope you had a wonderful celebration! Amazing cake that goes perfectly with a glorious venue! Beautiful details on the cakes. I especially love the gold accents, are they brushed in 24k? May I ask where you found the moulds for the scrolls and borders?